The Embassy of Austria on Tuesday celebrated its National Day in a very Austrian way. Music dominated all during the reception to celebrate the key event. An eight-year-old violinist grabbed the attention of audiences attending the reception at the Grand Hyatt Hotel in Seoul. Ko So-hyun played Mozart accompanied by piano played by Johanes Honsig-Erlenburg, president of Salzburg-based non-profit group Mozarteum Foundation. She played two more pieces after her performance as the audience who were fascinated by the violin prodigy shouted encore. The little violinist is the first prize winner of Baroque Music Competition last year. Honsig-Erlenburg praised her, saying she is talented. “I’m deeply impressed. This is really great talent. We’ll see how her performance will go in the future,” he said. Ko’s mom said while raising her young girl, she said her daughter was an average girl and therefore she didn’t recognize her daughter would be a violin talent. “When she was four years old, I sent her to a nearby private institute teaching violin to children. I did this because So-hyun kept saying she was bored. This just happened and I didn’t intend my daughter to be a violinist,” she said. Ko was one of the special guests who made the Austrian National Day special. 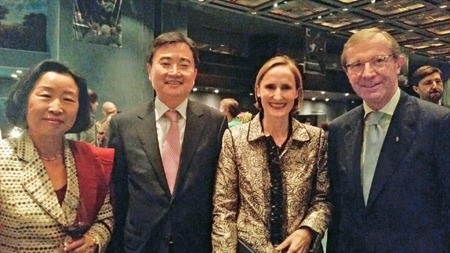 Days before the reception, Austrian Ambassador Elisabeth Bertagnoli told The Korea Times that music would feature at the reception and indicated that Ko would mesmerize the audiences. During a speech, Ambassador Bertagnoli noted the ever-growing Korea-Austria relations in trade, culture and people-to-people exchanges. She said Korea is the third largest market in Asia for Austrian companies following China and Japan. The envoy also mentioned about a rapid increase of Korean tourists to Vienna and Salzburg in recent years as a sign showing strong people-to-people exchanges between the two countries.